The site of the deserted medieval village we now know as Thorpe in the Glebe lies to the north of Wymeswold, just inside the Nottinghamshire border, to the east of the lane to Wysall. The place-name 'Thorpe' always denotes a daughter settlement. Such villages are usually on land which is less suited to farming or habitation than the older 'parent' settlements. Because of this Thorpes are more likely to abandoned when the climate worsens or the population declines, as happened with Thorpe in the Glebe. There is no clear evidence exactly when Thorpe in the Glebe was created but the tenth or early eleventh century is most probable. The land seems to have been taken from the already-existing parishes of Willoughby, Wysall and perhaps Wymeswold. Thorpe in the Glebe was listed as waste in the Domesday Book of 1086, probably a result of the actions of William the Conqueror's army when they travelled from Coventry to Nottingham in 1068 to suppress Earl Morcar's rebellion. A line of settlements from the River Soar to the Fosse Way were laid waste as part of this campaign. 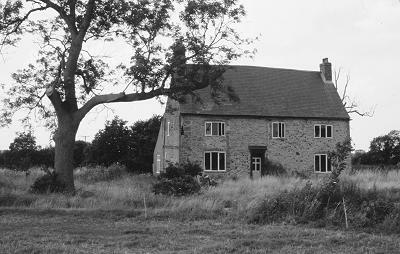 Morcar's manor was Nether Broughton. In Domesday Thorpe is referred to as Thorpe Regis, or King's Thorpe. However not all the land was held by the king, as Roger de Busli also held 40 percent of the arable land. The manorial rights between 1100 and 1300 were complex but the Bochars or Bozzarts family must have held the manor of Thorpe at some time as the village was known as Thorpe Bochart or Thorpe Buzzard. The church at Thorpe in the Glebe was founded sometime after 1220, seemingly jointly by the Luvetot and Bochard families. The manors passed through several families until in 1310 there was only one major landowner, the Mowbrays. Around this time the village is referred to as either Thorpe in the Glebe or Thorpe in the Clottes ('clotte' evolves into the modern word 'clod' and clearly derives from the clayey soils). Climatic changes in the 1340s would have made the heavy soils more difficult to farm successfully. The poor harvests of the early 1340s were followed by the arrival of the Black Death of 1349 which is estimated to have killed about 40 percent of the national population. Although there is no direct evidence presumably the population of Thorpe was similarly effected. Over the next 30 years the plague continued to prevent population recovery. Without sufficient able-boded men arable farming is unsustainable. Thorpe, along with nearby Stanton on the Wolds and many other settlements, seems to have become depopulated. In contrast Widmerpool, Willoughby, Wysall and Wymeswold survived. Presumably families moved from the smallest settlements to help sustain the larger ones with the more easily-farmed fields. By 1440 Thorpe seems to have been partly enclosed for sheep rearing; by 1500 the evidence is clear that almost all the lands of the parish were now pastoral rather than arable. Stock raising requires few workers and the one-time village would have shrunk to less than a handful of dwellings. Although the demise of Thorpe seems to be the result of depopulation followed by enclosure, popular folklore says that it was destroyed either by a hailstorm or as a consequence of the Civil War skirmish at Willoughby Field in 1648. The first is improbable as a primary cause – the damaged houses would have been rebuilt – and the second explanation impossible as by the time of the Civil War there had been no village at Thorpe in the Glebe for nearly 200 years. Survey of the surviving earthworks at Thorpe in the Glebe. Today all that survives of Thorpe in the Glebe is Church Site Farm (probably incorporating parts of the medieval hall), a moated site 700 metres to the south-east of the farm, plus ridge and furrow and well-defined platforms of some of the medieval dwellings. A hollow way about 10 to 20 metres wide and 430 metres long survives; a hedge now follows the line of this hollow way. This was the main village street. Running parallel is a sunken back lane. These earthworks are typical for Midlands medieval villages, although Thorpe is considered the most spectacular of Nottinghamshire's deserted medieval villages. Church Site Farm, Thorpe in the Glebe, in 2005. Over the years the village was known by a number of names: Thorpe Regis, King's Thorpe, Thorpe Bochart, Thorpe Buzzard and Thorpe in the Clottes. In recent years the Ordnance Survey have kept up this 'tradition' by creating an imaginary village called Windyridge on the Wysall Lane. This is shown on road atlases and is presumably part of their policy of including 'deliberate mistakes' to be able to identify people who publish computer-generated maps without paying the OS the appropriate fees. The map and all the historical information in this article is based on 'The deserted medieval village of Thorpe-in-the-Glebe, Nottinghamshire' by Alan Cameron and Colm O'Brien, Transactions of the Thoroton Society of Nottinghamshire, 1981, p56–67.